All of these "spooktacular" pieces were made by Geri Colgrove. This necklace was made by Geri. 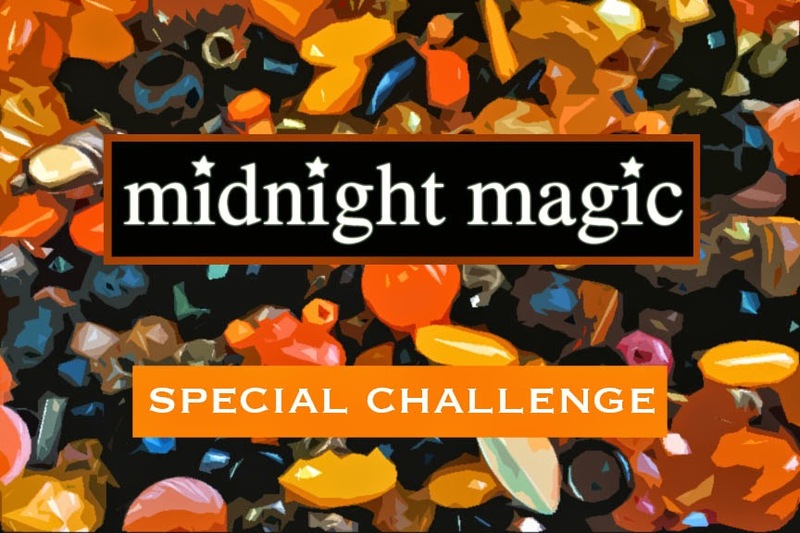 Here's what she had to say about it: "Midnight Magic, what a fun challenge! Black cats with black claws, a witch's hat, the broomstick, an evil eye, the glistening potion, and the mysterious spell of the copper Mystery Component medallion don this piece." Geri also made this bracelet. Here's what she had to say about it: "Spooky things, bat wings, charms, spiders, and skull will adorn the wrist with the handmade copper clasp!" She also made these earrings. Here's what she had to say about them: "And last but not least, the copper spiral enhanced orange and black earrings dazzle with haunting whimsy." "It's certainly not a trick, but it soon will be a treat to celebrate with the ghosts and goblins! I created this set with the challenge kit, copper sheet metal, and one additional copper charm. Thanks for the creative opportunity! Happy Halloween to all!" This necklace was made by Laurel Ross. Here's what she had to say about the piece: "I didn't want to go with the typical orange and black, so I focused on the orange and copper. I used vintage plastic beads, Czech glass spikes from the shop, carved Tibetan skulls from the shop, and some copper chain. I even made the shirt in the background as well!" These earrings were made by Alison Herrington. Here's what she had to say about these pieces: "I went earring crazy with this challenge. 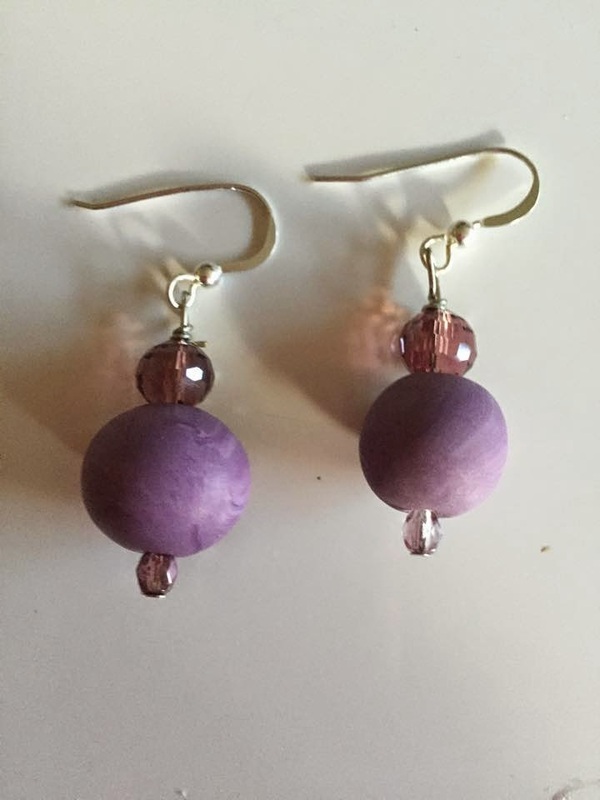 I had fun making asymmetrical earrings and also traditional matching sets." The fun isn't over yet! Check out what the other participants made for the Midnight Magic Challenge! Happy Halloween! We wanted to celebrate the holiday with a special Design Kit challenge. We named this special challenge, "Midnight Magic" and it included a blend of fiery oranges and inky blacks with pops of copper. We thought it would be fun to have a limited number of kits as well! The kit included Czech glass (both old and new), vintage Austrian glass, satin cord, Irish waxed linen, Hamilton gold, carved agate, corrugated gunmetal finish iron beads, ceramic, gunmetal, and a Luxury Bead Blend. The blend included a mix of African copper, Czech glass, Swarovski crystals and so much more! The kit also included a Mystery Component made by me! 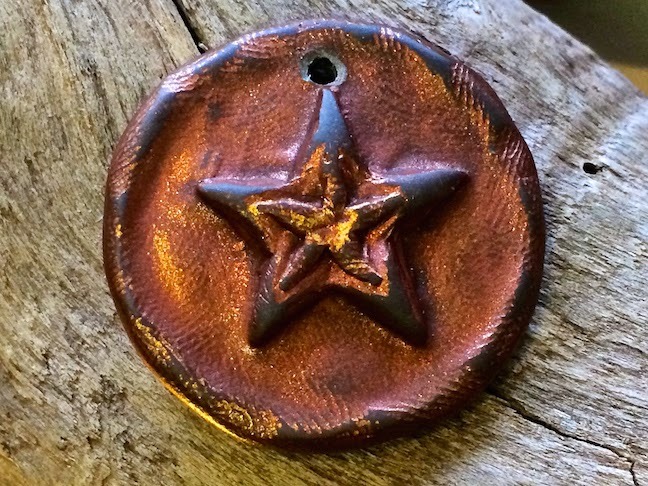 The piece that I sent was a polymer clay pendant with a stylized double star motif. I used warm coppers and burnt golds on top of a dark gray clay. I'm quite pleased with the way it turned out. I've been super busy, but I wanted to participate. So, I whipped together a "mesh" top layer made out of Czech fire polish beads and vintage seed beads. I used Right Angle Weave to make it. The under layer is composed of peyote stitch with black Japanese seed beads. It's reversible and can be worn with the orange on the outside or inside. If summer flew by, October was a lightning-fast smear of activity! It seems like I blinked and the month was already over. Even though the month zipped by too quickly, the end of the month also includes book club! 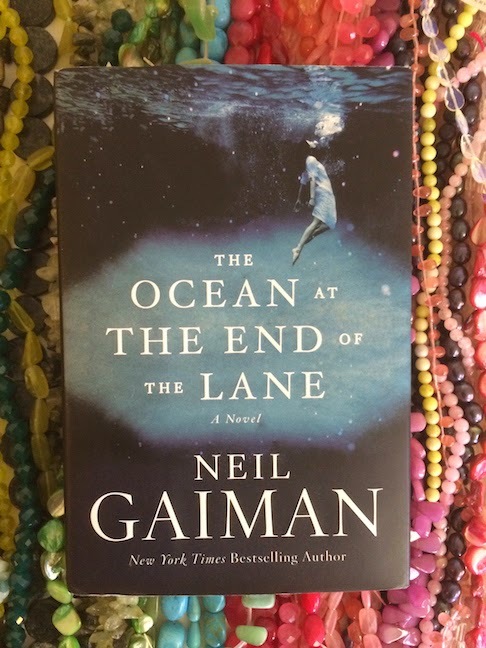 Today is the reveal for our October selection, "The Ocean at the End of the Lane" by Neil Gaiman. If you're not familiar with the Inspired by Reading Book Club, you read the book selection and then create something inspired by the book. The book we read this month is about a man who recollects a fantastical adventure he had as a child with the neighbor at the end of the lane. The tone of the book had a fairytale quality, weaving together seemingly ordinary life with impossible worlds and ghastly monsters. While there's certainly heart-racing adventure, the novel touches on thoughts of isolation, the loss of innocence, and what it means to remember. Most of the participants agreed that they enjoyed the book and would recommend it to others. I always look forward to our meet ups, but this one was extra special! We had several participants come in that don't usually get to attend. Jeanne came in all the way from the Hamptons, Terri drove in from Ohio, and Sarajo and Eric won the prize for traveling the furtherest! They came in from Minnesota! It was definitely nice to see friends and catch up. Thanks to Alison, we enjoyed scones featured in the book in paper bags. She also brought a warm apple pie and birthday cake topped with little black kittens (also from the book). We gave out toothbrushes with green handles as party favors. Sarajo and Eric brought a home-brew (which was one of Eric's projects) and toffee from Scamp's toffee. Terri brought some British snacks, Laurel brought our customary book club moscato, and Jeanne brought a lovely bottle of red wine. It was a lot of fun! At times we all laughed so hard it hurt and had to wipe tears from our eyes. I'm so glad that everyone who came, got to come to the meet up. Of course, we missed all the participants who didn't get to come and thought of them fondly. Hopefully we'll get to have more of these big meet ups with our far flung members. Terri made this necklace from a Smucker's Jelly jar, links she learned how to make at a retreat with Heather Powers, chain, nylon mesh tubing, and Astroglide! The latter ingredient had just the right viscous quality to suspend the mesh. There's a wormhole (both literally and figuratively) that gets placed in a jelly jar. This necklace was made by Alison. She was inspired by the gray and pink coloring of one of the characters from the book and an orange sky. She used wire-wrapped wooden beads and jump rings to make it. Alison also made this bracelet that can also be worn as a necklace. She too was inspired by the wormhole in the book. She used silvery grey peanut/dumbbell/farfalle beads with right angle weave. At the end, she used a heart link. Laurel made this fiber necklace from old t-shirts. It can be doubled up to be a neck warmer. She was inspired by all the references to fabric in the book, including gray rags that hang from the ceiling at one point in the novel. I made this necklace for my project. In the book, money starts appearing in the most unlikely of places... including the belly of a silvery fish! I made the fish and attached him to some strung up opal chips. The opal is a nod at one of the characters who is an opal miner. Here's a close-up of the fish. I made it out of polymer clay, drilled the Sixpence and partially embedded it in the belly. I drilled it so it wouldn't come loose. The eye is a glass pearl. The surface of the fish was finished with Glider's Paste, acrylic paint, alcohol inks, powdered pigments, interference paint, nail polish, and sealant. It may seem like overkill, but I wanted it to have the look of a real fish that's wet and turns colors in the light. 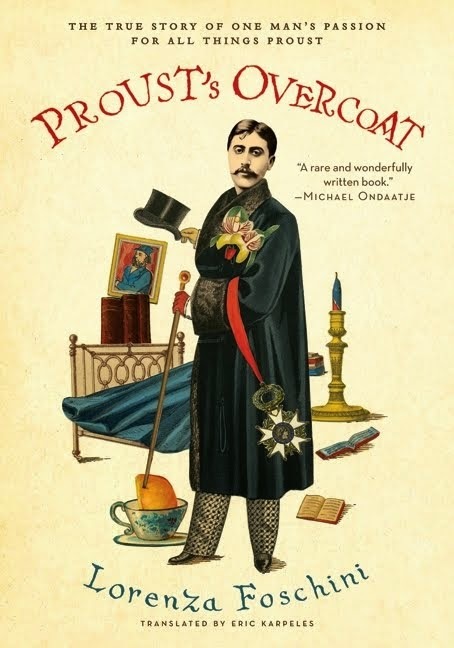 The next book up is "Proust's Overcoat" by Lorenza Foschini. For this year's list, CLICK HERE. 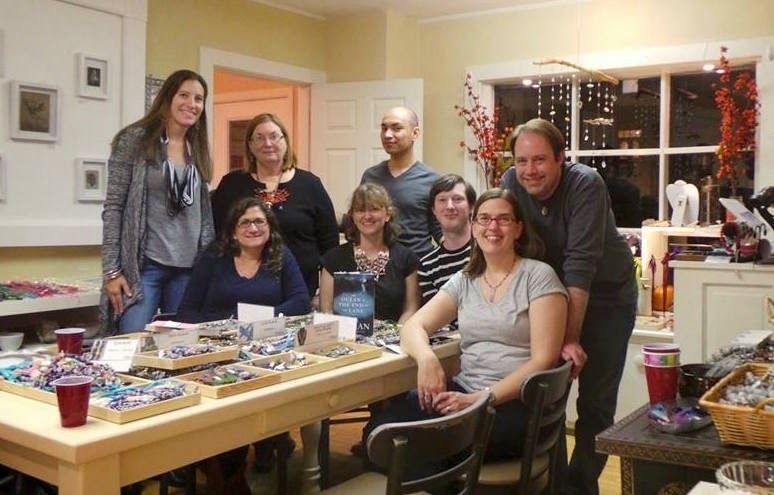 The in-person meet up at Allegory Gallery is scheduled for Wednesday, December 3rd. The next blog hop is planned for Thursday, December 4th. It's a short book, so perfect for a busy holiday month! If you're interested in keeping up with what we're doing, CLICK HERE to visit the Facebook page. Jewelry artist tackle the same materials and come up with creative results. Andrew hosts design challenges on his blog. 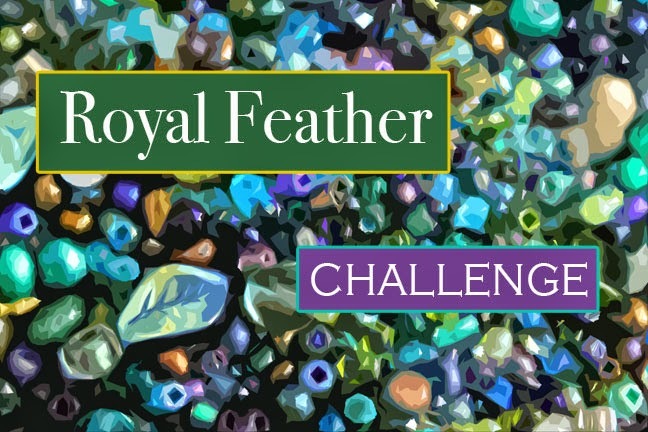 Check out the different approaches each participant took in the reveal for the Royal Feather kit! Is it possible to live a sparkly dream? Lisa says, YES! She's sharing some exciting Swarovski news this week. Color Palettes features the art beads of Margit Boehmer - bright, beautiful and not to be missed! Is anyone not inspired by Max Ehrmann's Desiderata? Eileen signed up for a postcard art Desiderata theme swap and couldn't stop at just one. 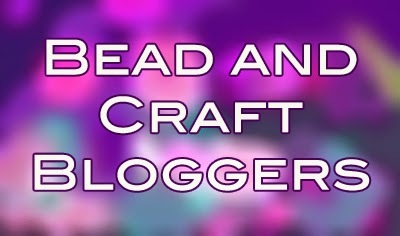 Enjoy some amigurumi goodness in this seventh video podcast from the Crafty Princess Diaries. Cherie uses the Bible verse from John 3:16 as inspiration for art. A pocket watch becomes a pendant with Pebeo paints, a rub on and resin. Cyndi has a fabulous Czech bead giveaway going on this week! All are welcome to join in! A few years ago, I did some designs for JessImports! I feel so honored to have my work included in their beautiful offerings. The designs I created are now available! They are some of my all-time favorite skull designs! JessImports now makes the very popular Mini Skull Charm, Crowned Skull, and Skeleton Key. They're perfect for Halloween (or anytime if you ask me)! CLICK HERE to see their awesome skull jewelry component selection! Hurray for big news! I've been sitting on this information for a little while now, but am pleased to be able to share it finally! I've made allusions to it on my Facebook page, but couldn't definitively talk about it until now. Cynthia and I are really happy about this new development and hope you'll join us in a little cheer! Hip! Hip! Hooray! You're probably wondering what it is exactly that we're asking you to cheer for. Our class proposals for Bead&Button 2015 have been accepted! We'll be co-teaching two classes this summer and I hope you'll attend. *The dates and times are tentative and are subject to change. Also, the classes may be canceled if there aren't enough sign-ups. So if you're interested, sign-up early and bring a friend! Online registration begins in January! I'll post more information as it becomes available. 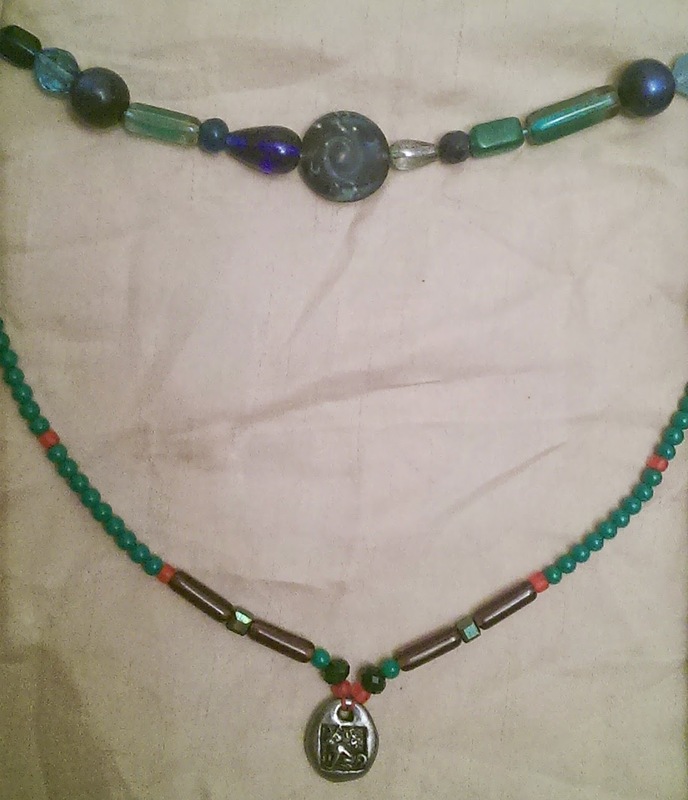 This necklace was made by Cheryl Lee Tucker. 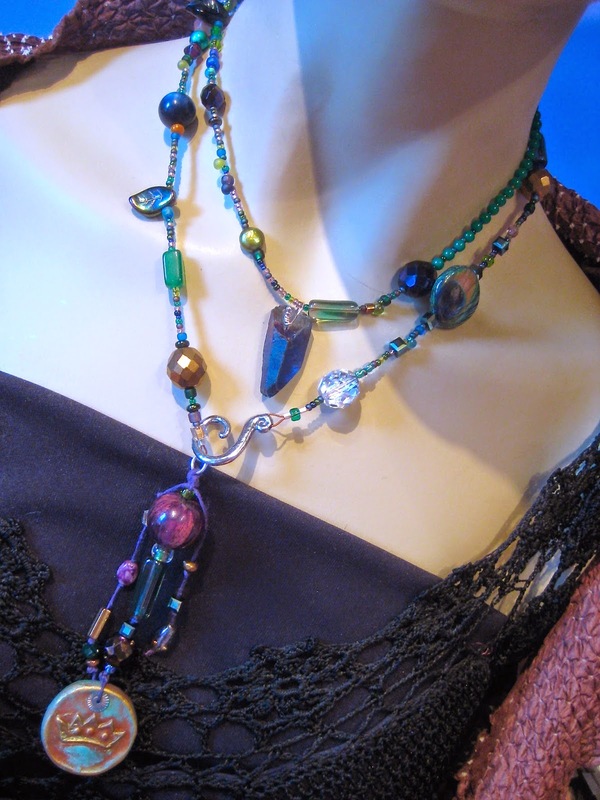 Here's what she had to say about it: "My necklace is made with just the blue and metallic beads in the kit. I wanted to emphasize the crown focal and the gold highlights. (I love the greens and purples too... but I need more time to work with those and life got in the way!) This is my first attempt at a beaded bezel and a handmade clasp, so I am really excited at how well it all came together." These necklaces were made by Crystal Lombardo Farrell. Here's what she had to say about them: "The colors in this kit remind me of the ocean, so I went with that kind of theme for the top necklace. The bottom one is a gift for my husband. The focal is from Green Girl Studios. He loves dogs and the color red and he commented on how much he liked these round green beads. So I wanted to find a way to incorporate all three." This pair of earrings were made by Joanne Goldberg. Here's what she had to say about them: "My arm has been in really bad shape and I haven't been able to bead as much as I would like. I still wanted to participate in the reveal and made this quickie pair of earrings. They're made of polymer clay from Andrew, and Czech glass and crystal from the kit." This necklace was made by Marcia Gilbert. Here's what she had to say about the piece: "This is my first time participating in one of the challenges through Allegory Gallery. I had a lot of fun playing with the kit. I don't have a blog, so I'm glad that Andrew could post the picture of the necklace on his. The piece uses almost everything from the kit. For the focal I made a beaded "eye" of a peacock feather." This piece was made by Laurel Ross. Here's what she had to say about it: "For the base of the necklace, I created wire-wrapped links. Practice makes perfect! 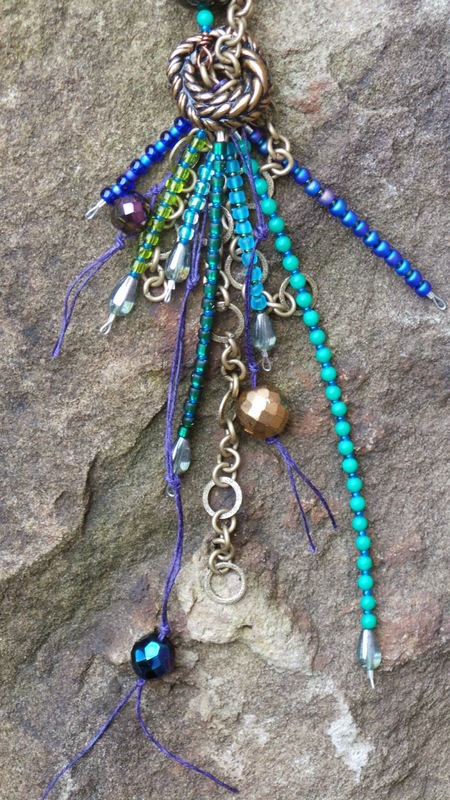 The focal is an eclectic tassel made up of elements like chain, waxed linen and seed beads." "As a side note, the necklace is perched upon a rock that I got from the foundation of the barn that used to be on the Ross family farm, a Ligonier landmark since the early 1700's! Cool, huh!?" This piece was created by Alison Herrington. Here's what she had to say about it: "I'm still in love with the multi-strand waxed linen bracelet design by Lorelei Eurto. I've been having fun playing with different combinations of beads using this technique. Thanks, Lorelei! For my Royal Feather Challenge bracelet, I used the Mystery Component by Andrew Thornton, four glass donut beads by Hobo Glass, Czech glass leaves, tubes, and faceted rounds, a rubber "o" ring, and fancy large peanut seed beads." This piece was made by Tara Linda. Since she's traveling and on the road for band she's in, she's requested to break her reveal down into two parts. The first part is here and the second part is on her blog, where she'll show a bracelet and a pair of earrings that she also made. CLICK HERE to visit her blog. Here's what she had to say about her creation: "For my primary piece, I had a blast making a long lariat. It is 42" long and doubles at about 17". The only beads I added: a few pearls, one heavy quartz spear for weight in the center, and a Green Girl Studios hook for a clasp to one end of the strand. I was inspired by the opera length necklaces, but love the utility of a lariat and all the lengths and variations it can be worn. The peacock colors are the essence of opulence and celebration to me; so a long necklace that shows off many beads and their purple/green/copper hues seemed fitting. I used the sequins on either side of the awesome crown pendant, and strands of small crystal beads on the waxed purple linen. I also made earrings and bracelet that you can see by visiting my blog later this weekend!" These pieces were made by Keisha Russell. Here's what she had to say about the piece she put together: "This is my first time being in the Challenge and I was very excited to actually be able to purchase a kit. I really liked working with various pieces, from the vibrant colors to the different shapes and textures. The peacock bead was ultimately my favorite component and I tried my best to showcase it. I started working on one design, but as I continued, the design morphed into something totally different. I am proud of the pieces that I made and the fact that I completely the challenge. Also I still have many other components left over. Thank you Andrew and hopefully I am able to take part in other events." This necklace was made by Margriet Schnabel. Marian Howarth, Margriet's friend, fellow beader, and past challenge participant, sent in this picture of Margriet modeling her creation. Here's what she had to say about the piece she created: "I made this multi-strand Peacock Necklace with the Royal Feather Challenge kit and a few added extras. I mixed in a purple artistic jasper pendant from Dakota Stones, mini Russian amazonite nuggets from LimaBeads, and Kenyon copper heishi."